As the world's third largest economy, Japan is leading the way for aging societies. 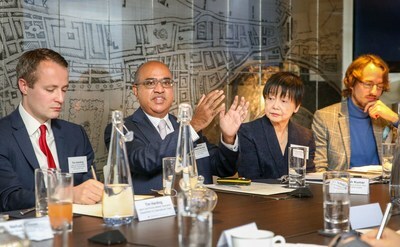 This transformative initiative has significant implementations for the economic growth of the UK, representing immense business opportunities as its population also ages. The event "Open for Business: Capitalising on Japan's Digital Healthcare Economy during this Era of Aging Societies" hosted by the Government of Japan and moderated by Martin Koehring, Managing Editor and Global Healthcare Lead, Thought Leadership, The Economist Intelligence Unit, featured Professor Sudhesh Kumar Dean of the Warwick Medical School and Non-Executive Director at NHS Digital, Shinsuke Muto, Chairman, Integrity Healthcare Co., Ltd., Yumiko Nishimura, Advisor-Japan, Health 2.0/HIMSS and Kazumi Nishikawa, Director, Healthcare Industries Division, Commerce and Service Industry Policy Group, Ministry of Economy, Trade and Industry of Japan, who joined via video conference from Japan. One-fifth of Japan's citizens are 70 years of age or older, putting it at the forefront of demographic changes now facing many other developed nations, including the UK. Taking this unprecedented challenge of a super-aging society as a transformative opportunity, the Government of Japan is working on implementing a new patient-oriented healthcare system by 2020. This initiative, which includes data and technological innovations to promote healthier lifestyles, provides strong opportunities for the UK to collaborate with Japan across many areas of healthcare innovation, such as the Internet of Things and Artificial Intelligence. At the event, speakers discussed how Japan is well placed to serve as the world's test bed for the emerging digital healthcare economy in this era of aging societies; the country's high quality data around medical, health and long term care, generated from the country's universal healthcare system covering its 127 million citizens, is hugely attractive to scientists and businesses. Advanced technology including Artificial Intelligence and the Internet of Things, coupled with the data, is spurring new business creation, which delivers healthcare more effectively and efficiently for the countries sharing the same demographic change, including the UK. "There are many areas Japan can work together with the UK for realising life-long active societies through open innovation. I expect further collaboration with UK companies and research institutions for value-added market creation, to solve our shared issues going forward." - Kazumi Nishikawa, Director, Healthcare Industries Division, Commerce and Service Industry Policy Group, Ministry of Economy, Trade and Industry of Japan. 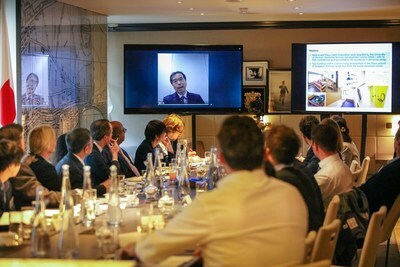 The event, "Open for Business: Capitalising on Japan's Digital Healthcare Economy during this Era of Aging Society," was supported by the Japan Agency for Medical Research and Development (AMED) and the Japan External Trade Organization (JETRO) London.